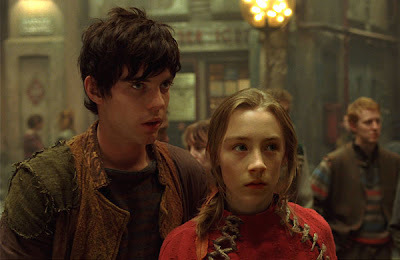 Some stills from City of Ember movie were sent to CinemaBlend. Very interesting. I'm a little worried about about it, though; I haven't seen much about it, but the little I've seen makes me wonder how true to the book it'll be. And the abundance of light bulbs in these pictures seems to bear that out. I sure hope I'm wrong, though. I did love the book. The early publicity of the film dismayed me though because it gave away the premise of the story from the very beginning. The whole mystery of the city and where it was is part of the charm of the story for me. To give it away from the onset is a shame. I do think Murray could be hilarious as the corrupt mayor. I agree. It's one of those books that the unfolding of the mystery is part of the pleasure. 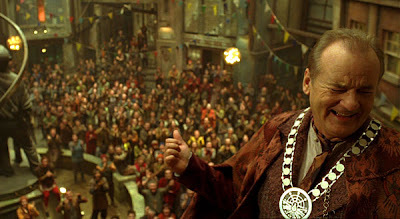 And I also agree that Murray could be great as the Mayor. I keep telling myself that it's a good thing that so many YA books are being made into movies. I am really looking for to The Lightning Thief, as well as I'd Tell You I'd Love You, but Then I'd Have to Kill You. Like anything, some will be good, and some will be bad. Bill McMurray will be interesting, at the least!